Dar Al-Hijrah (The Homeland of Emigration) Islamic Center is a Mosque and a cultural Islamic center located in Falls Church Virginia. 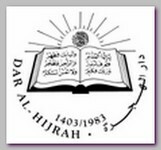 Dar Al-Hijrah was founded in 1982. Among the founding group was also Ismail Elbarasse, a known Hamas supporter. With time Dar Al-Hijrah became one of the largest and most influential Mosques in USA with about 3,000 attendances in the weekly Friday prayer. The area has a large Muslim population, many of them from Palestinian descent. Dar Al-Hijrah center provides social services on a relatively large scale. During the Ramadan month the center serves over 800 free meals every night and every one, including non-Muslims, is invited. Dar Al Hijrah Center has social services department that provides food, clothing and other household items weekly to needy families of all faiths in the local community. The center operates a Youth Center as well as an Islamic School called the Washington Islamic Academy in North Virginia. Dar Al-Hijrah also co-sponsors an annual civic picnic along with other Northern Virginia organizations, in which candidates for local office meet Muslim voters. Today (10/2008) the Imam of the Mosque is Shaker Elsayyed and Imam Johari Abdul-Malik serves as the general director of the Islamic Center. The religious leader, one of the founders and former Imam, Sheikh Mohammed al-Hanooti, was named as an unindicted co-conspirator in the first World Trade Center bombing, on 02/26/1993. Other dubious mosque members have included: Abdurahman al-Amoudi ; Abdullah Bin Laden – Osama’s nephew; Hamas leader and fugitive Mousa Abu Marzook, his partners Ismail Elbarasse and Abdelhaleem Ashqar, who was sentenced to 9 month in jail for refusing to testify in a terror fund raising investigation case before a Federal Grand Jury in February 1998 ; convicted Virginia Network leader Randall Royer – Ismail, a former CAIR official; and Ahmed Omar abu-Ali, an Al Qaeda operative convicted, on 03/29/2006, of plotting to assassinate President Bush. Sheikh Anwar al-Awlaki, one of the leading figures in the Islamic center and a former Imam in San Diego, California, is on the FBI Terrorist watch list. Dar Al-Hijrah Islamic Center represents the two faces of Islam. On one hand The Charity, social welfare and care for the needy – on the other hand the radicalization and the silent support to Global Jihad.